Soft and crumbly coconut cookie base loaded with sweet cherry filling and topped with crunchy coconut crumble. 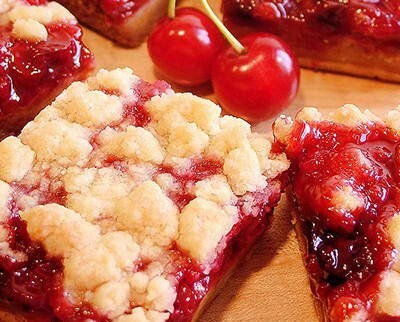 Here is a delicious and easy to make dessert recipe for Cherry Coconut Squares. Preheat oven to 375 degrees F. Lightly grease a 9-inch square pan. Sift flour and salt together, and add to creamed mixture. Mix in coconut flakes. Pack half of the mixture into prepared pan. Spread cherry pie filling on top. Sprinkle remaining crumb mixture on top of pie filling. Pat down firmly. Bake at 375 degrees F for 25-30 minutes. Remove from oven and cool in a wire rack. Cut into 16 squares. Store leftovers in an air-tight container and refrigerate.